The CEEK VR Gift Card will enable most compatible Android and Apple iOS VR devices with plans for integration with Oculus Go, Samsung Gear VR, HTC Vive, Microsoft Mixed Reality Headsets and Google Daydream headsets. The CEEK VR Gift Card will allow Ceekers to buy subscriptions via in-game currency (Ceek) which is an ERC20 token. With the VR Blockchain integration, the points never expire. When users enter their access code, an equivalent value of Ceek is deposited into their digital wallet and can be applied towards all CEEK products and services on the CEEK VR platform. 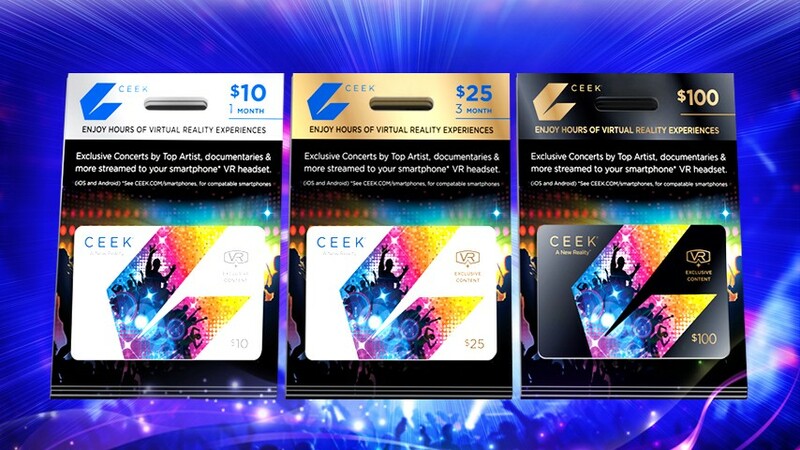 CEEK VR — The award-winning, premium, streaming platform with patent-granted products, and service, designed to bring the world of Virtual Reality to the masses via entertainment, education and healthcare today announced that it has made history as the first VR company to launch a gift card designed to scale VR entertainment transition from a niche product to mass adoption. The dire lack of premium content for VR headset buyers often results in high device return rates at retail, but the CEEK VR streaming platform makes it easy to access a variety of premium entertainment experiences. 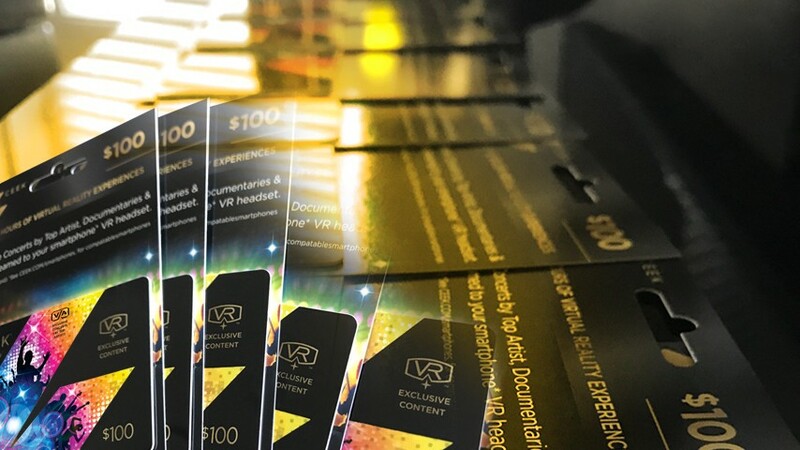 From music concerts to documentaries and independent movies in 360 VR, Interactive VR, True 3D and 2D in social VR environments, the first ever Virtual Reality Gift Card CEEK VR ensures that no matter what Virtual reality headset consumers purchase, people can have access to premium VR content. Target will be the first retailer to offer Ceekers (CEEK VR customers) the CEEK Virtual Reality Gift Cards in store, alongside Gift Cards from the likes of Starbucks, iTunes and Google Play. The CEEK VR gift card is available in $10, $25 and $100 values and redeemable for all CEEK products and services. CEEK VR’s monthly subscription rate is $9.99, 24.99 for 3 months and $99.99 for an annual subscription. Last year CEEK integrated with Apple iTunes Card which is available on all our products, and now the CEEK Virtual Reality Card makes it even simpler for Ceekers to access our platform. “We are getting great reception in this highly competitive retail space because of our award-winning, patent-granted innovative immersive solutions featuring a growing library of premium content from the likes of Lady Gaga, Katy Perry, U2, originals from Grammy winning artists, over 100 concerts from iconic and emerging artists as well as a powerful lineup of exciting Live Streaming concerts planned.” says CEEK VR CEO Mary Spio. With increasing demand for our premium streaming services in Latin America and Africa, the card will also serve as a great way for the unbanked, users who do not have access to online banking, credit cards or other digital payment methods, or those who prefer not to use credit or debit cards but want to enjoy premium virtual reality experiences to easily and conveniently fund their accounts and access our content. It is a win-win-win for VR device makers, retailers and most importantly Ceekers worldwide. CEEK VR’s mission is making access to the Metaverse accessible for everyone and this innovative technical integration is a giant leap toward that goal. Still a fairly new startup, CEEK VR has been ramping up their content offerings. CEEK VR has solved the issue of accessing premium Virtual Reality content across various VR marketplaces and on various devices via a fully immersive user friendly and easy to use interface. CEEK’s initial focus is primarily music, independent films and e-sports. The company plans to broaden its user base by transitioning to other industries including education, fitness, health and wellness. What is the CEEK VR Gift Card? The CEEK VR Gift Card is a prepaid voucher which entitles the buyer to access to CEEK VR platform in-game currency equivalent to the value loaded on the card. Gift Cards can be loaded with between $10 to $100 and they don’t expire. For example, a gift card loaded with $10 will give you 1 month of CEEK VR streaming, $30 will give you 3 months of streaming and $100 will give you a full year of streaming. Do I get access to Games on console and other VR headsets such as Oculus VR. Or HTC Vive with my CEEK VR Gift Card? The battle for the VR Marketplace is heating up between the likes of HTC and Oculus, and quite frankly we do not care who wins because CEEK will be everywhere. Our aim is not to be that marketplace but specifically a provider of premium experiences in entertainment primarily music that is available everywhere and accessible even on competitor VR headsets. In fact we have already generated revenue licensing to most, and have agreements to provide content to others. What VR Headsets Will I Be Able to access my CEEK Account on? Mobile headsets that are compatible with your smartphone as long as you have access to Apple App Store and Google Play store. Keep in mind the CEEK VR app works best with newer smartphones. Check for Ceek Support compatible phones. We are also working on accepting the gift card on Oculus Go, Samsung Gear VR, HTC Vive, Google Daydream and Microsoft Mixed Reality Headsets headsets. Anyone with access to a compatible VR device for streaming content. Existing Ceekers can use the Gift Card to add more Ceek coins, while those who do not yet have an account can redeem their Ceek by downloading the Ceek App and entering the pin code printed on the back of the card in their CEEK Account. CEEK VR will deduct the appropriate amount depending on the plan you choose. Upon entering the access code, the appropriate amount of CEEK coins are added to the user’s wallet. Since CEEK coins are ERC20 Tokens the value of the coins vary based on the current market value of the coin. The cost of products and services are fixed according to the fiat value. Where can you buy a CEEK VR Gift Card? Ceekers will be able to purchase CEEK VR Gift Cards from selected retailers including Target stores. CEEK has teamed with one of the nation’s largest prepaid product and payments technology company, which means our distribution will continue to grow globally to an increased number of stores.